New research reveals that African American and HispanicÂ men in the United States are less likely to receive treatment and therapy for prostate cancer compared to Caucasian men–even when they developÂ a more aggressive form of the disease. The paper, entitled: Racial/Ethnic Disparity in Treatment for Prostate Cancer: Does Cancer Severity Matter, published in the journal, Urology, was authored by doctors at Roswell Park Cancer Institute in Buffalo, New York, and Vanderbilt University Medical Center in Nashville. “Less treatment may play a significant role in increased rates of death from prostate cancer,â€ he says. The study utilized data for 327,641 men diagnosed with localized prostate cancer between 2004 and 2011. The researchers evaluated factors including race, age, treatment, marital status, year of diagnosis, whether or not the men received definitive treatment as well as the D’Amico risk classification, which helps to evaluate the risk of recurrence following localized treatment of the disease, and Gleason score, used to evaluate the prognosis of men with prostate cancer by indicating how likely it is that a tumor will spread based on a range from 2 to 10. When looking at patients with a Gleason score of seven or higher, the researchers found that even when they had a high risk of prostate cancer, African American and HispanicÂ men were less likely to receive therapy compared to Caucasian and Asian American men. However, they also noted that it is possible that many of those men opted to defer treatment while continuing in the care of medical professionals, an approach known as watchful waiting or active surveillance. After analyzing the D’Amico Risk Model, the researchers found that African American men diagnosed within each category–low, intermediate, and high-risk disease–had significantly lower odds of receiving definitive treatment. Hispanic men with intermediate or high risk also had lower odds of receiving treatment. African American menÂ are hit hardest byÂ prostate cancer and there is already a significant gap in how the disease affects black men compared to other races. African American men are roughly 1.6 times more likely to develop prostate cancer than white men and 2.6 times more likely than Asian American men, according to Harvard Medical School. According to the Prostate Cancer Foundation, among men aged 45 and above, blacks are roughly 2.4 times more likely to die from the disease compared to whites. The Centers for Disease Control and Prevention states that prostate cancer is the fourth leading cause of death among black men over the age of 45. 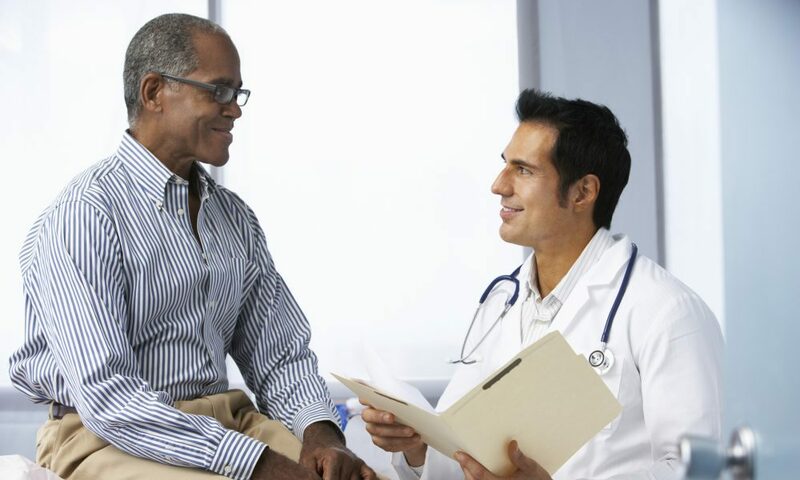 Scientists still do not have an answer for this disparity, though possible reasons include biology, environment, and socio-economic factors such as unequal access to healthcare,Â which makes some African American men less likely to receive regular physical examinations and screening.Â According to the PCF, black men should start screening for prostate cancer at age 40.